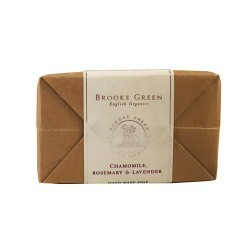 This soap has a fresh herbal fragrance of rosemary and lavender, which is complemented with soothing chamomile. Rosemary and lavender are valued for their mildly antibacterial properties and are thought to alleviate stress. Ideal for both men and women and combines well with the matching Chamomile Hand and Body Lotion and Hand Repair Cream. Sodium cocoate (coconut oil), sodium rapeseedate, sodium olivate (olive oil), organic rosemarinus officinals (rosemary), organic lavandula augustifolia (lavender), organic chamomilla (chamomile).